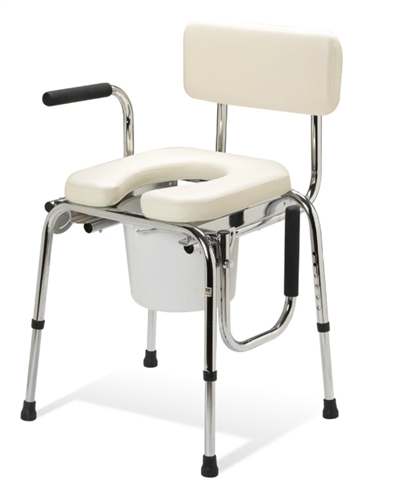 Guardian Padded Drop Arm Commode Chair features arms that swing out of the way for easier lateral transfers on and off the commode. Transfers are easier for patients using a wheelchair. It has a weight capacity of 350-pounds. Place it near the bed with the arm down for patients transferring during the night for use as a bedside toilet. The seat height is adjustable from 20" to 25". The Medline Padded Commode comes standard with pail, lid and splash guard.